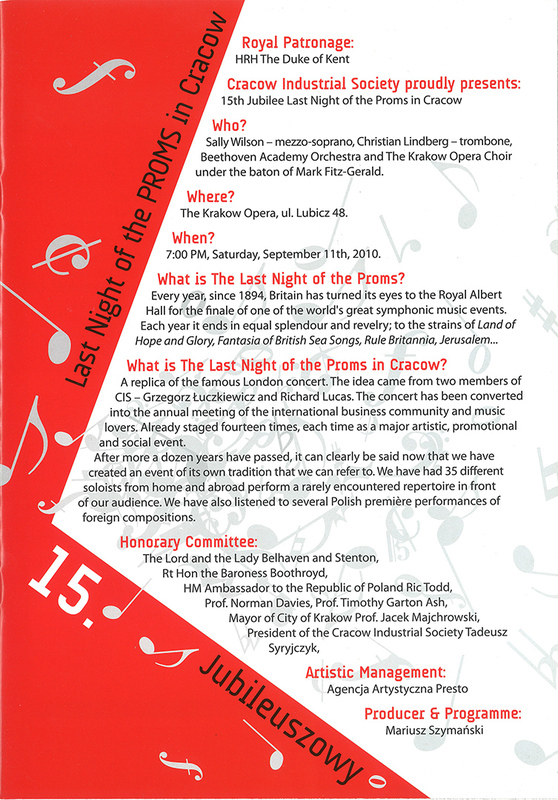 ‘The Last Night of the Proms Cracow’ yearly concert was established in 1996 by members of the Cracow (British / Polish) Industrial Society (KTP). The patron is HRH The Duke of Kent, the Honorary Committee include: The Lord and Lady Bellhaven and Stenton, the Rt Hon Baroness Boothroyd, Tadeusz Syryjcyk (President of KTP) and the current British HM Ambassador. 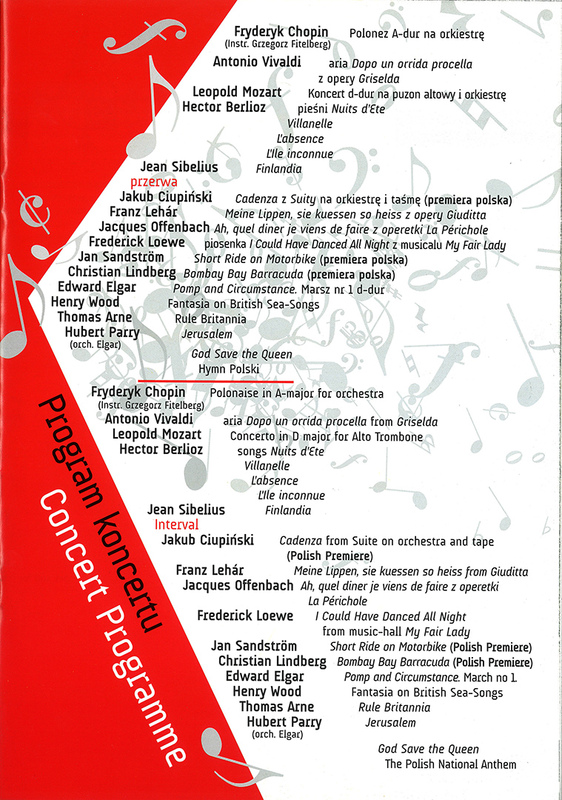 With the help of major sponsors the concerts are produced by Mariusz Symanski. As far as possible the dates and programmes were the same as the London ‘Last Nights’ plus the Polish National Anthem. However world premieres of composers’ works in London were out of the question, not only were these works written exclusively for the BBC but also Central European time is always one hour ahead of Great Britain. These works were replaced by various (often 20th century) works by Polish composers. The first concerts (starting 1996) were conducted by Jerzy Maksymiuk. Jonathan del Mar, at the suggestion of his wife, Annabel, who is the great niece of Sir Robin Bellhaven and Stenton, a member of the organising committee, conducted the 2002 concert. Jonathan suggested Mark for 2003 for whom it became a regular fixture for the next 9 years. All concerts took place in the Cracow Philharmonic Hall (aka Karol Szymanowski Concert Hall). The Polish Radio National Symphony Orchestra (based in Katowice, where the concerts were rehearsed) played for Mark’s concert until 2008 when Mariusz Symanski invited the Beethoven Academy Orchestra to take their place (as logistically they were based in Cracow). Depending on availability choirs were used alternately: the Polish Radio Choir and the Cracow Philharmonic Choir. The main (and some unusual) programme features including the following – 2003 Penderecki’s ‘Hymne an den heiligen Adalbert’, also this concert ending in the EU Community anthem, Beethoven’s Ode ‘An die Freude’ from Beethoven’s 9th Symphony to mark Poland’s forthcoming membership of the EU (May 2004). * This concert also featured Dave Lee playing Richard Strauss’s Horn Concerto No. 1 and soloist Arkadius Bialic playing Samuel Barber’s ‘Toccata Festiva for Solo Organ and Orchestra’ (first performance in Poland). Lutosławski’s ‘Little Suite’ and Sir Peter Maxwell Davies’s ‘Ojai Festival Overture’ (first performance in Poland) were also major features of this programme. 2005 main features were Walton’s ‘Portsmouth Point’ overture, Panufnik’s ‘Polonia Suite’ and Korngold’s ‘The Sea Hawk’ film music. The two sons of Prince Edward, Duke of Kent, Lord St Andrews and Lord Nicholas, attended to celebrate the 10th of these very special concerts. They not only stayed at the same hotel as Mark but were also on the same air flight on the way back to London as well as having a celebratory drink at the British pub, (‘John Bull’), after the concert. They were great and appreciative company throughout. The 2006 programme had an enormous variety ….. Shostakovich Festival Overture, Charpentier Louise aria, Eric Coates, Gershwin starring Iwona Sobotka. The 2007 concert started with a virtuoso and very successful challenge, the complete 2nd Act of Szymanowski’s ‘Harnasie’. Many compliments were made by experts on this composer’s music who said that they had never heard such a well-balanced performance of this work. *2004 Mark was engaged to conduct an open air concert to celebrate this important event on the border towns of Frankfurt an der Oder (Germany) and Słubice (Poland) with the Brandenburg State Orchestra on the evening of April 30th in the presence of the Ministers of Culture of both Germany and Poland. 2008 was a very special year as Mark was also making world-première recordings (at the request of Mrs Irina Shostakovich) of unknown Shostakovich works with the NPRSO in Katowice for Naxos. Two world premières took place at this concert in Cracow. The original first movement of Shostakovich’s Ninth Symphony (it had never been heard before as the composer couldn’t face the completion of this version of his symphony) was a world première. The great Norwegian trumpet player, Ole Edvard Antonsen played amongst other works the Haydn Trumpet Concerto with cadenzas by Krzysztof Penderecki which had never been heard before. The 2009 concert (and also the first concert with the Beethoven Academy Orchestra) started with Grazyna Bacewicz’s overture (written in 1943 it contains some dangerously concealed victory quotes from Beethoven’s Fifth Symphony) and later in the programme in Mieczysław Karłowicz’s romantic tone poem ‘The White Dove’. The second half started with Malcolm Arnold’s Grand Grand Overture featuring four VIP soloists playing the four solo vacuum cleaner parts. However for security reasons, the British Ambassador, Ric Todd, was only available to rehearse with the other 3 soloists backstage in the interval. His theatrical performance was masterful. Meanwhile the same work was being performed at the RAH Prom and irritated Annetta Hoffnung greatly, by ignoring her performance instructions. Another Norwegian brass soloist, Øystein Baadsvik (tuba) was soloist at this concert with such works as the Vaughan Williams Tuba Concerto and Monti’s Czardas. The 2010 concert took place in the new Cracow Opera House. It featured the Swedish trombone soloist, Christian Lindberg. His items included the Leopold Mozart concerto and first Polish performances of ‘A Short Ride on a Motorbike’ by Jan Sandström and Christian’s own composition ‘Bombay Bay Barracuda’. The Polish première of Jakub Ciupiński’s ‘Cadenza’ for tape recorder and orchestra also featured in this concert. The 2011 concert started with Stephan Kisielewski’s ‘Little Overture’ (1953). Just before the interval it featured John Cage’s 4’33” in the full orchestra version in 3 movements, I tacet, II tacet, III tacet. The American pianist Kevin Kenner was soloist for the Ravel G Major Concerto as well as Chopin’s Grand Polonaise in E♭. Prom committee member, Lady Małgosia, was born in Cracow and was confirmed there by Bishop Karol Wojtyla who later became Pope, St Jean Paul II. Lord and Lady Bellhaven and Stenton as well as their daughter, Olenka, have remained life-long friends with Mark.